About half a billion years ago during the Cambrian period, in the early years of multicellular life on Earth, there existed a creature out of our nightmares. A scaly arthropod, distantly related to today's lobsters and spiders, Fuxianhuia crawled along the ocean floor with those insane-looking tentacle legs. Those limbs may also have been involved in eating. The authors of a new paper in Nature believe that Fuxianhuia may have been one of the first creatures to develop legs, and it had a lot of them. Those big front legs are just the beginning — it also had a ton of hind legs that almost look centipede-like. The fossils described in this paper offer our first view of the legs of the creature. Here is what most fossils of this arthropod look like — you can see the outer carapace but not the feeding tentacles. 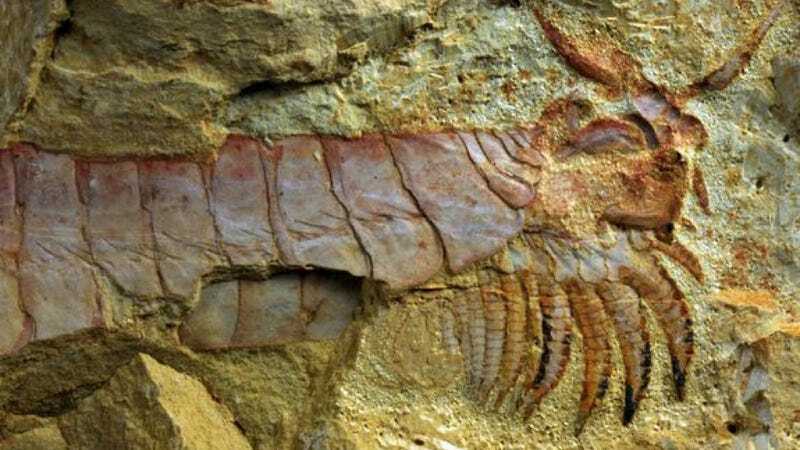 Last year, this fossil and a few others helped scientists to identify this creature as one of the first that may have had a brain, or a complex nervous system that extended beyond its head. Read the full scientific article in Nature. Thanks for the tip, ErasmusSB654!